Football's ability to unite - even in testing times - was brought to the fore by German fans. Explosions that damaged Borussia Dortmund's team bus in Germany on Tuesday ahead of a Champions League quarter-final against AS Monaco delayed the game by a day, and leaving some away fans stranded. 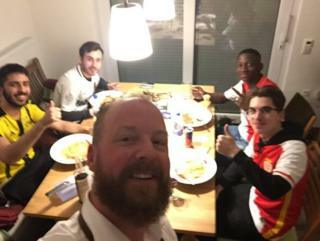 In response, Dortmund fans were opening their homes and hearts to fans of the Monaco-based team, using the Twitter hashtags #bedforawayfans and #tableforawayfans to offer their hospitality. One AS Monaco fan, Adrien Thomas, told the BBC that he and four of his friends found a place to stay using the hashtag. Mr Thomas shared an image of them having breakfast together, and extended a "big thank you" to the Dortmunder who hosted them, adding that an unfortunate event had been "turned around to create a great relationship between fans of the two teams". "When terrorism tries to divide, football unites," one Twitter user said. Others shared similar photos online. Dortmund fan @vespafoto showed images of himself with AS Monaco fans around the dinner table, enjoying a good night's rest in sleeping bags, and gathering for breakfast. He had initially sent out a tweet, offering five AS Monaco fans a place to stay for the night. His guests thanked Germany and tweeted an image of the pasta dish they shared. One Twitter user said that this demonstrated football's "true class". While another Dortmund fan, who said he had three beds available at his flat near the stadium, tweeted a photo with the away fans he hosted, captioned: "Football unites." One Twitter user said that this was "a great positive example of how to use social media for good in a dark moment. Bravo to all the good people out there!" "If #bedsforawayfans doesn't make you think soccer/football is the greatest sport on Earth, then nothing will," another added.